We’ve talked before about the School of St John on Dos Hermanos. About how people who have worked at that restaurant at one time or another have branched out and set up their own places serving food which is based on Fergus Henderson’s blueprint. There’s now a parallel network developing which we could call the River Café School. Two restaurants which have opened recently are members of this school. 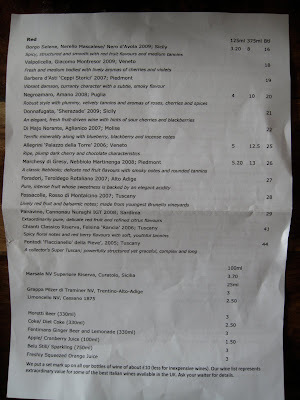 A few weeks ago I visited current fave of the critics, Zucca in Bermondsey, which served up a pretty tasty meal, albeit a bit uneven. 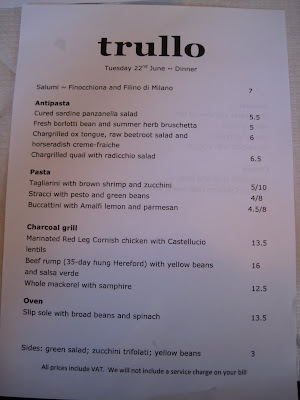 I was alerted about Trullo by those very nice people at HOT DINNERS. It’s only been open a couple of weeks but if my recent visit is anything to go by is already beginning to generate a real buzz north of the river. So what qualifies it as a member of the RCS? Well, FOH Jordan Frieda worked at the RC and chef Tim Siadatan was one of the original apprentices at Fifteen which was owned by Jamie Oliver who also worked at…the RC. Got that? Good. On with the post. Located on a busy road by Highbury corner Trullo is a canteen-like space with New Yorky light fittings and paper tablecloths. It looks a little haphazard but I’m sure a bit of thought went into it. I liked it and within minutes of arriving I was sitting down drinking a chilled prosecco and munching terrific homemade sourdough bread dipped into a peppery olive oil. Which is how all meals should start. A couple of things struck me immediately. 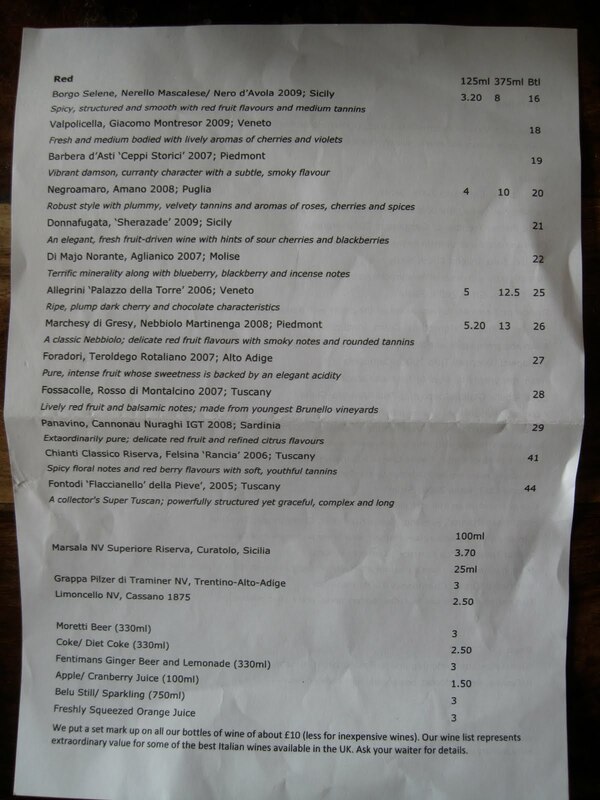 Both the short food menu and the longer wine menu seemed very reasonably priced. Indeed the latter boasts that the maximum markup is a tenner which makes other places with 3-400% multiples look pretty silly. The food menu is necessarily short because I suspect the kitchen brigade is pretty small – I suspect it might only be the one person – even so it still manages to be an attractive menu which you’d want to eat most of. Even vegetarians get a look in. In keeping with the tenets of classical Italian cuisine the dishes here combine a few good ingredients to produce something greater than the sum of its parts. As I get older my preference is for an uncluttered style of cooking and the cooking at Trullo is right up my culinary alley. The food here just tastes right. After some decent Salumi – although the cured meats of Italy are never going to be up there with Spain – was a primi of Tagliarini. The delicate, silky strands of the pasta had been combined with a generous number of brown shrimp. Like the sequins on a ballroom dancer’s dress I did wonder how long it had taken to shell them all. Whatever, the end result was perfect – firm, tasty little, er, shrimps. Interspersed throughout were shreds of green and yellow courgettes. There was a pretty strong chilli kick of which verged on being too strong but wasn’t (forte ma non troppo if you will). Interestingly, it was the sort of chili that seemed to numb the lips rather than catch in the throat. A lovely dish, the sort you’d hope to get in Italy, let alone N1. And all for a fiver. I’ve railed against the way fish is cooked in this town before. I’d just about given up ordering it because many kitchens overcook it which can turns a decent piece of fish into so much cat food. Luckily the kitchen at Trullo knew exactly how to cook my Slip Soles. The fish was very fresh and cooked so that the flesh took on a little colour yet was still firm. Some spinach, a few shelled broad beans, a little bit of olive oil and a wedge of Almalfi lemon. It looked appetising and tasted even better. Unimprovable, really. The cooking had such a light touch that I did wonder how many different dishes I could manage for dessert. However, it was early in the week so I just went with the one pud, a lovely, beautifully textured Cherry Ice Cream. Thanks to an act of kindness by a neighbouring table I also got to try a Melon granita and a Pannacotta and can confirm that they were great too. As codas go a stong, dark Espresso combined and a glass of Grappa wasn’t too shabby. 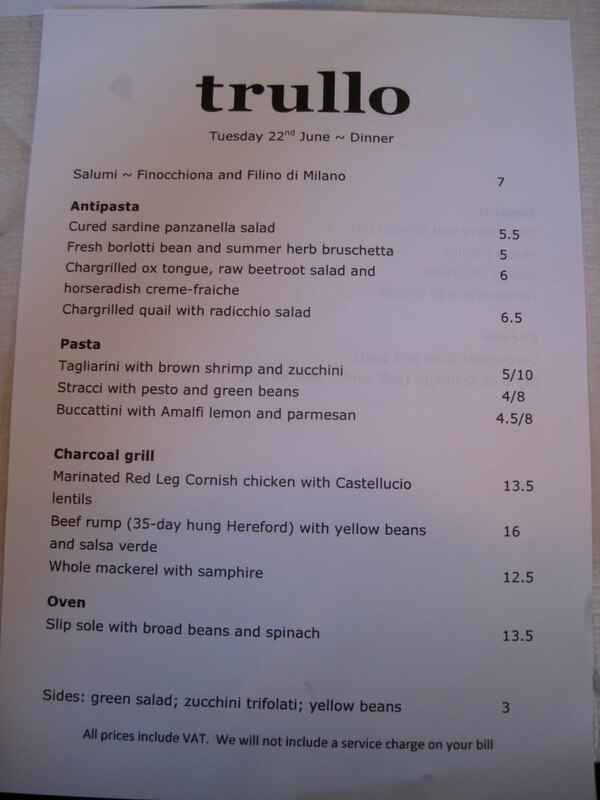 So just as SoSJ has disseminated the things that are good about British food and cooking it seems the RCS is doing something similar for Italian food, in London at any rate, and on this showing Trullo is a leading exponent of that cuisine. At the end of the meal I made another booking which tells you all you really need to know about what I thought of my meal and this restaurant. What with 500 not a million miles away it seems that part of town is becoming Little Italy (sort of). Have you tried the ice cream from Gelupo? It's very good indeed. It was ok although I must admit I find the gelato here a bit too gummy compared to the stuff I had in Naples. At Trullo they serve Ice Cream which I prefer.